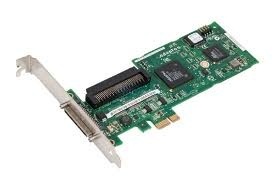 My goal is to use VMWare to run Backup Exec 2012 and utilize the internal Adaptec 29320LPE SCSI card. 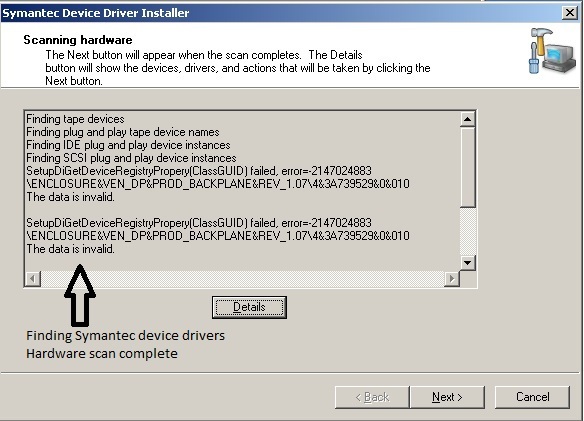 When I boot into Windows, the device manager doesn't see the Adaptec 29320LPE card. 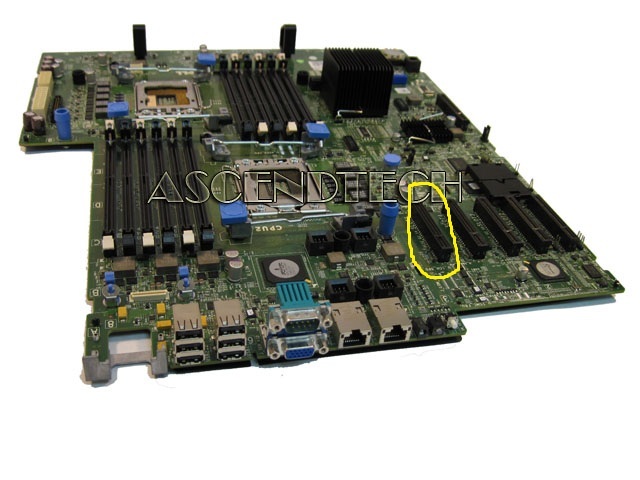 I've gone into the Resource Allocation area of the VM, Edit, Hardware tab, show all devices checked, and added a SCSI Device at SCSI ID 0:1 to represent the Adaptec 2932LPE card. SCSI ID 0:7 is not available. I've gone into the Adaptec SCSI bios and both the SCSI card and tape drive appear at SCSI ID 7 and 0 respectively. Unfortunately, I've some bad news for you. Tape Drives are tempermental under ESXi 4.x and 5.0, the best way to try and get them to work, is to install a dedicated SCSI controller in the host, and use VM Direct Path to present the PCI card to the VM, connect the tape drive to the SCSI card. This is the approved and supported method by Overland and Symantec. Note: VMware does not support Tape Drives connected directly to ESXi 5.0 which is documented under Release Notes for vSphere 5.0. You need to install the Backup Tape Drive drivers and run abackup from Windows wit Backup Exec. Based on your comments, I thought I had a dedicated SCSI controller card installed with the tape drive connected to the card. The only thing I think I'm missing is the VM Direct Path portion. Is VM Direct Path an add-on to VMWare or is it built into it already? If so, where can I find it? I think I need to address at least getting Windows Server to recognize the SCSI card before I can install the tape drive drivers, correct? see here how to setup its included with ESXi 5.0, yes you need to get this working first in the VM. Yes, however Backup Exec does not use the drivers that comes from the tape manufacturer. Backup Exec only uses it's own tape drivers. I went through the link you provided and was able to get the SCSI card to be enabled in the passthrough section. I reboot the VM Server and the green light was on the SCSI card. I went to add the card to the VM and when I selected SCSI Device, the only two things that came up were CD\DVD and Unknown DP. I selected Unknown DP and assigned it to SCSI (0:1) SCSI device 1. I'm sure that is incorrect as Windows still doesn't see the device. Prior to all of this, I went into the BIOS of the server itself and turned on VT as it was disabled. I opened BE 2012 but I don't have "Tools, Wizards" options. I tried to find where I could toggle between what I have and what the document says to do, but was unable to do so. I ran the "tapeinst.exe" file and picked up at Figure 4. I uninstalled the drivers and rebooted. I ran tapeinst.exe again and followed the directions only to be shown that the device was not detected. Please see attachment. once the card is added to the VM, just treat the VM as a physical server. did the VM install the drivers for the SCSI card? 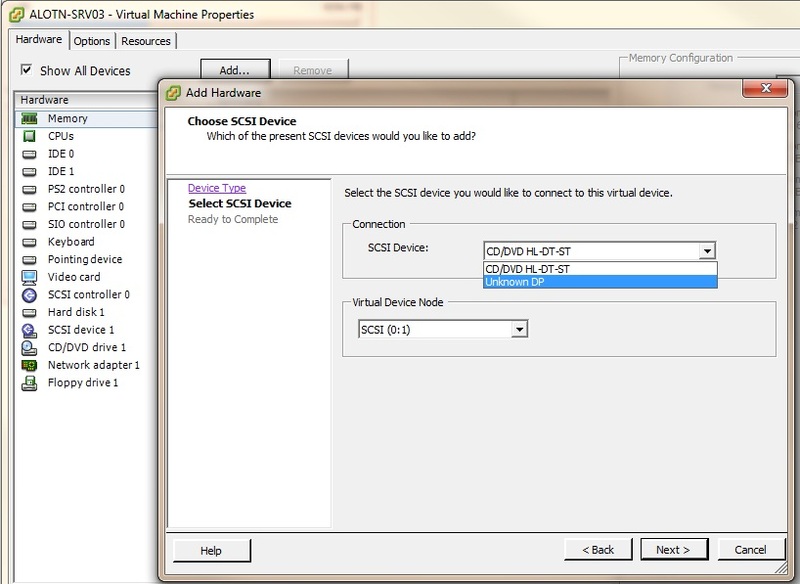 do not add a separate scsi device to the VM this is scsi passthrough and not VM Direct Path. please also note my first post! Ok, I did as you suggested and treated the VM as a physical server. I did NOT add it to the VM as a new SCSI device. I just left it in the passthrough area with the green light on it. One additional thing I just noticed...I went to device manager and selected to show hidden devices and noted that "vmscsi" had issues. Please see attached. 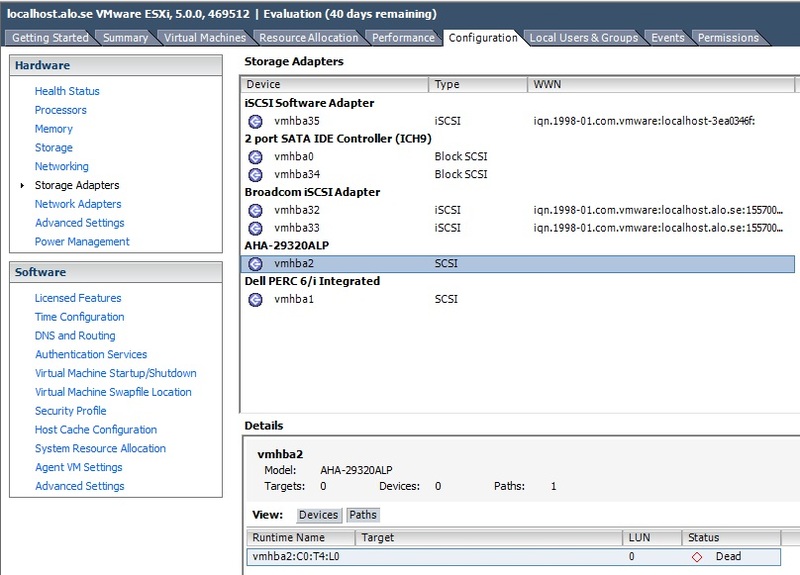 have you added a PCI device to the VM? Now, back to not being able to see the card in Windows. Any thoughts there? YOU ATE NOT USING SCSI PASSTHROUGH DIFFERENT TECHNOLOGY. HAVE YOU ADDED A PCI CARD DEVICE TO THE VM? I am using Passthrough, not direct path. 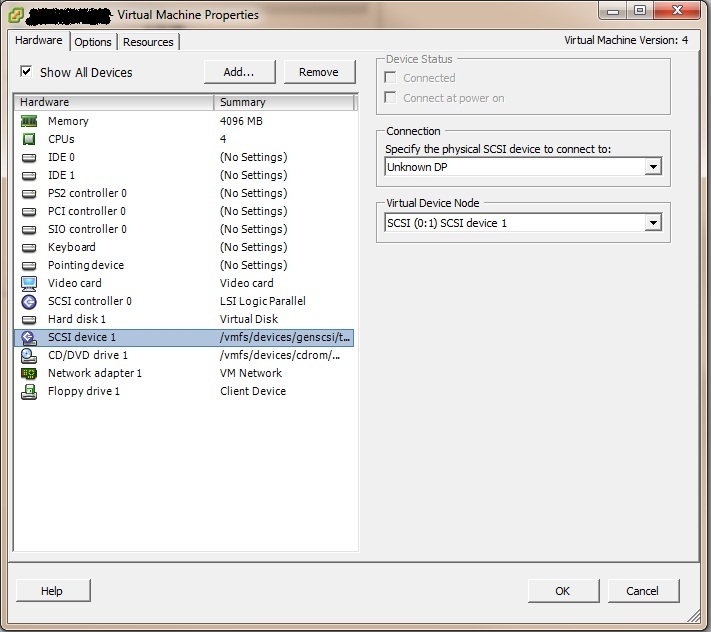 There are NO PCI Card devices in the VM. See attached. SCSI Passthrough is not recommended and does not work reliable or supported. It's not recommended by Overland, Symantec Backup Exec, their recommeded option is VM Direct Path. (as I mentioned in opening response!). A VM with dedicated PCI (SCSI CARD) added using VM Direct Path, and this is also crap! and does not work reliably! hence, why ALL our customers abanonded tape with ESXi! You know hanccocka, people use this service for help. Perhaps I'm not as technically saavy as you, that's why I use this service. Excuse me for not completely grasping everything you have had to say. If you are so easily irritated by people like me, perhaps you should reconsider assisting people in this forum. If there is anyone else out there willing to assist without an attitude, I would appreciate your help. Sorry, if it comes across that way, but Tape Support is difficult with ESXi. There is no easy solution, hence why VMware stopped supporting it! 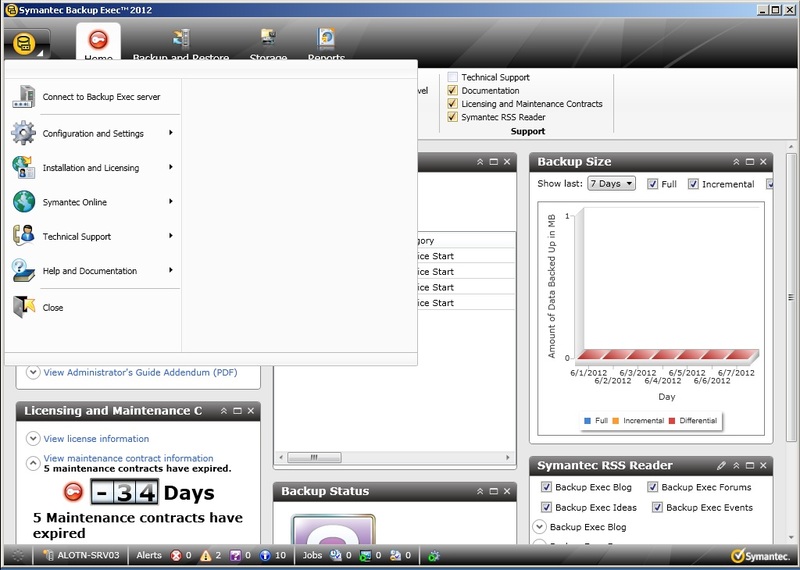 Tape Backups are not supported by VMware, and passed it to the vendor. They found the best chance of working was VM Direct Path. Passthrough the PCI card, add to the VM, and then treat as Physical Machine from their on. Recommended Option is VM Direct Path. It's all unreliable, but VM Direct Path is your best chance of a working solution. Does you server support VM Direct Path and do you want to use VM Direct Path? Okay, I've re-read all youre comments again. and I think I know, which bit you are missing here. Once, you have added the PCI SCSI card using VM Direct Path which you have completed. You then also need to Edit the VM Settings (Right Click VM, Edit Settings), and add a PCI Device, in my example it states unavailable because I've not added a SCSI card via VM Direct Path. But on your server, you should be able to add this SCSI card added previously in VM Direct Path to your VM. Once you have this VM communicating directly with the SCSI card in VM Direct Path I/O mode, hopefully Windows will plug and play and install drivers for this SCSI card, and then you should be on the route for Detection with Tape Drive. This is the recommended method, but I may add it's supported by Vendors, Symantec and Overland not VMware, and still has issues. Unfortunalteltly, this may not be the result you desire, but I'm still trying to help you with your solution, although it may not work. Click Configuration > Storage Adapters. I selected the virtual machine that use the tape device, and click Summary > Edit Settings. 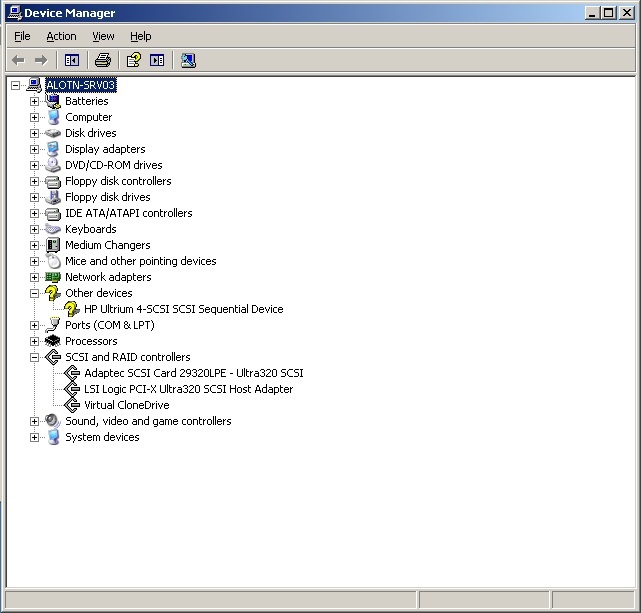 Select SCSI Device from the list of device types and click Next. This is where I get stuck. I want to believe that the card should show up in the SCSI Device drop down from the previous step. Okay, let's get on with trying to solve the technical issues at hand, thanks for sticking with us. It was not my intentions to offend, sorry, if it came across that way. let me have a read and look at screenshots. It's cool hanccocka...frustration on both sides :) Apology accepted! Looking forward to your findings. Okay, I've had a quick look at the VMware Hardware Compatibility List, and it suggests the T610 is not compatible with VM Direct Path. Argh...so nothing else you can think of then...bummer. Well, sorry I wasted your time with this but thanks for trying. Select Host, Configuration, Advanced Settings? Does it state if supported? If I enable passthrough it shows it as an active device with the green "on" button. Is that what you mean? So when you selected the Host, Configuration, Advanced Settings, you were able to Add the Card. Okay, well that's fantastic news. VMware Hardware Compatibility List is WRONG! Okay, lets proceed to next steps. You will need to Power off the VM. and select AHA-29320ALP, from the drop down, Next and Finish. Windows should Plug and Play and Add the Drivers automatically. 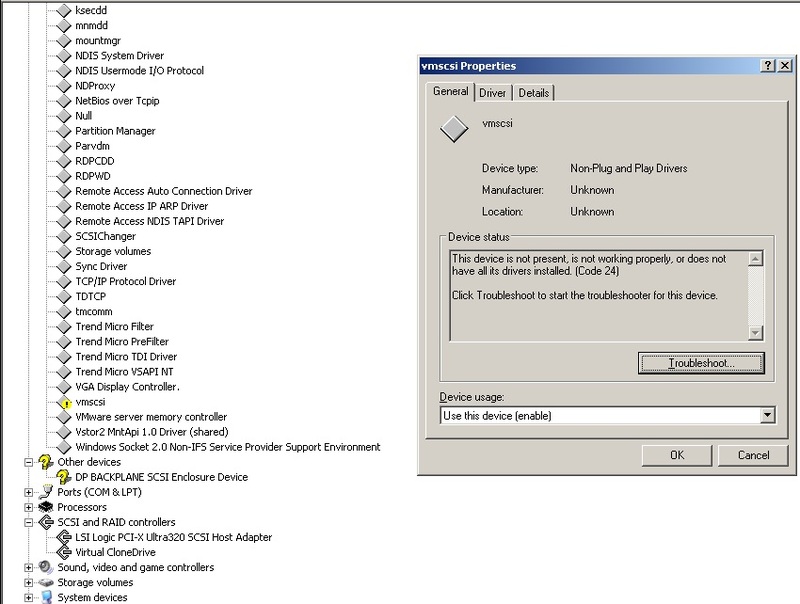 You should be able to confirm, by selecting Device Manager, and check Under SCSI Controllers. That all sounds correct in my opinion, however, PCI Device is not an option for selection. 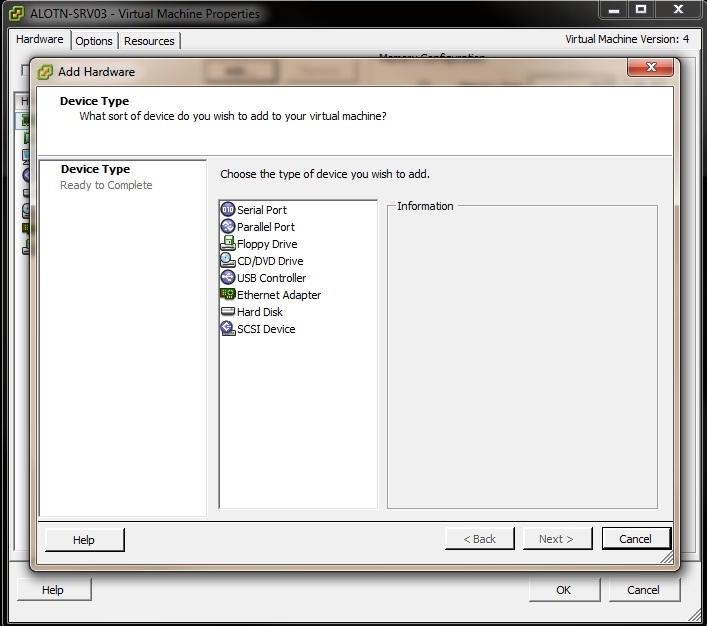 I've attached a pic of the mobo, Adaptec card and a screenshot of the Edit settings, Add hardware section. It's like VM Server sees the card, but the VM doesn't. ah, okay, this is because you are running a Virtual Machine version 4.0 and not 7.0, 7.0 is required for PCI. Do you have an option which states Upgrade Virtual Machine Hardware? Are you VMware Tools Update to Date? e.g. it does not state out of date tools? 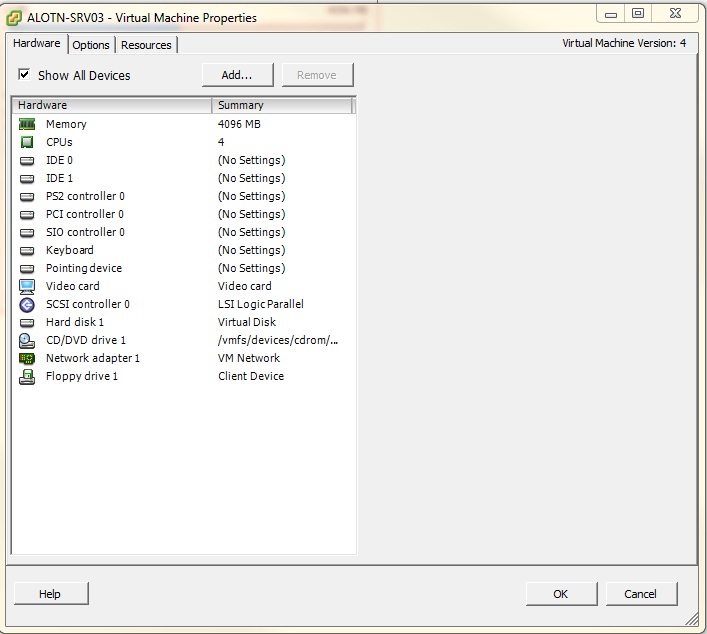 You need to Right Click Virtual Machine and Check if the Option ot Upgrade Virtual Machine hardware is present. Okay, ensure VMware Tools are up to date, and Click Upgrade Virtual Machine hardware. You may have to re-start the VM to check, you do not get Out of Date VMware Tools, it's important tools is updated before Virtual Machine Hardware. 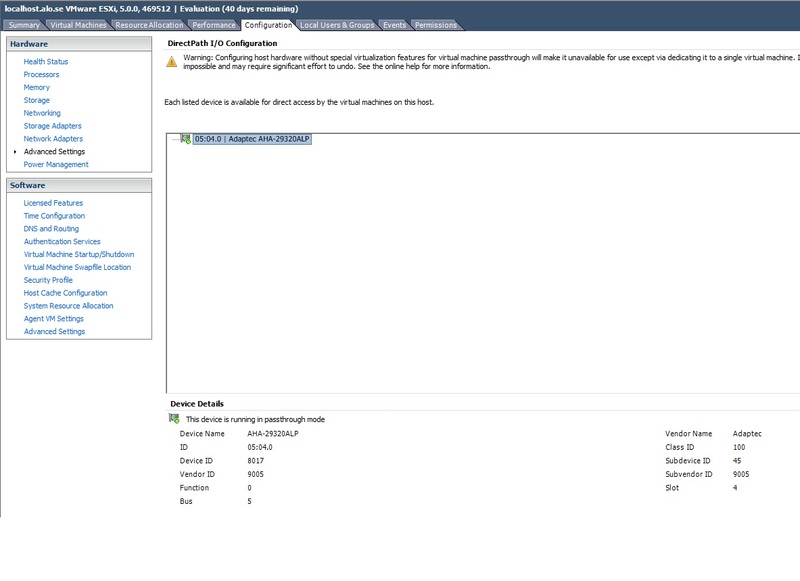 Could not power on VM : Admission check failed for memory resource See the VMware ESX Resource Management Guide for information on resource management settings. 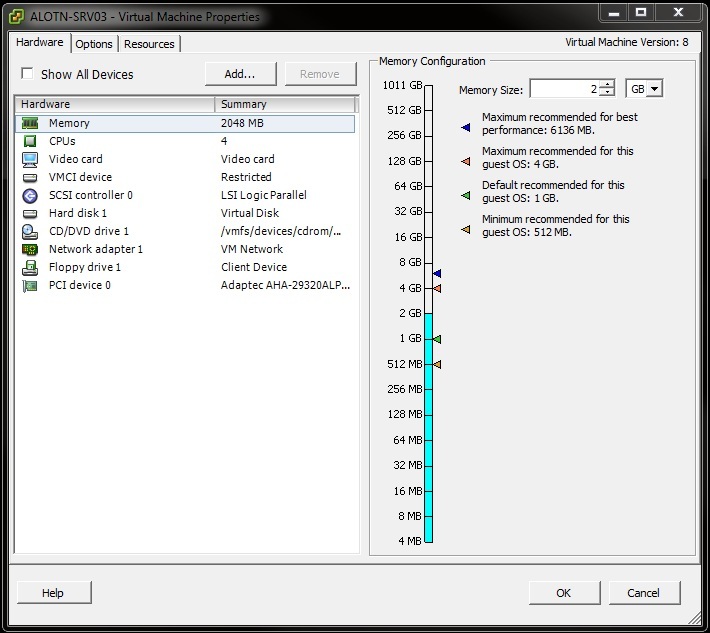 check cpu and memory for the VM. Also check the resources tab, and reduce the sliders for memory and cpu tomzero. I've left it at '0' and also tried making the memory reservation to equal 6136. Module MemSched power on failed. An error occurred while parsing scheduler-specific configuration parameters. some paramater is not compatible with a v7 vm. how much memory does the host have? you not added the PCI device yet? okay, this is the issue 6GB host, with 6GB VM? 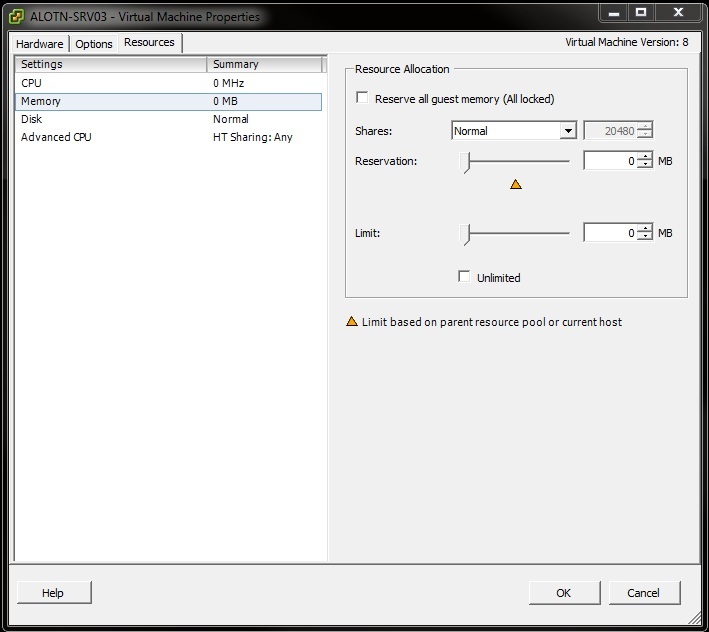 not enough Host Memory, you will need to reduce the ram in the VM. Adding a VMDirectPath device to a virtual machine sets memory reservation to the memory size of the virtual machine. was it at 2GB previosuly? Yes, with a PCI Device the Reservation Must be equal to memory in the VM. Original memory allocation was 4096MB. After removing the PCI Device, the VM booted up without a problem. Okay, so we've not broke the VM. do you have any other VMs on this host? and the host only has 6GB? 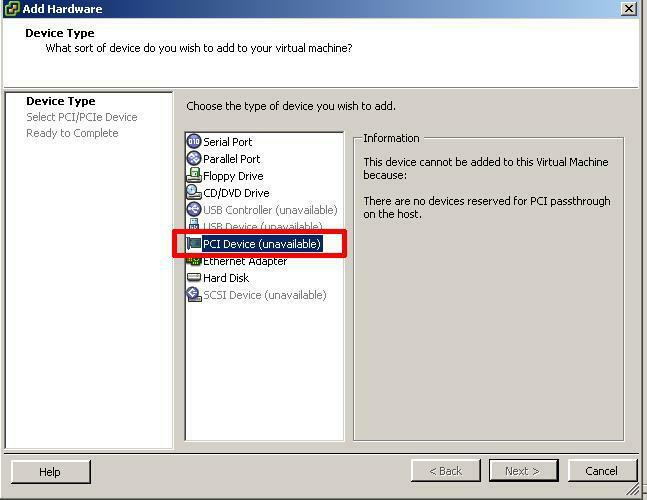 when you add a PCI device a reservation must equal memory in the VM, if that memory is not available to the VM, at power on, this is the reason for the error. because reserved memory is ring fenched and stolen from the host for this VM. when memory is not reserved, your VM will start, but it will be using 4GB, when reserved it will be! and if you set a reservation to 4096, does it fail at power-on? I think the problem was the order of things. I had the VMServer with 6GB and the VM with 6GB. After removing the PCI from the VM and THEN reducing the memory to 2048MB and THEN readding the PCI, it allowed me to boot to the desktop. So, you suggest I reduce the number of PROCs to 1 and bump the memory up to 4096? Checking now to see if the card is in device manager. I would certainly start low (vCPU = 1) and Memory Low and increase if required. What is the VMs role? hanccocka! You're the man!!! Even the tape drive is showing up as being there but no drivers installed. I've learned more from you today than I have in the last two weeks trying to figure this out on my own. Thanks so much for your patience with me and this issue. Made my day! This is the recommended method of adding a tape drive to ESXi 5.0 (although not supported by VMware). This is the supported method Overland and Symantec will recommend. 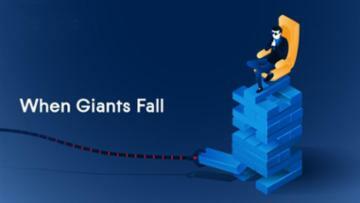 BUT, be warned strange things can happen still, and for those issues with Backup software you will need to possibly raise with Symantec or Overland. and Virtual Server using VM Direct Path is a different beast to a Physical Machine with a Tape Drive connected. hanccocka worked with me all day on this and we were able to get Windows to see the SCSI card and Tape Drive. It was stressful for a minute but we got over it and were successful getting things going again. Thanks for your hard work. Certainly couldn't have done it without his help!